Even though many of us would like to make our own ice cream, frozen yogurt or sorbet because its healthier and sometimes cheaper, we usually don’t because it takes time to make and our lives are easier if we just buy frozen desserts from the grocery store. A machine like the Cuisinart ICE-30BC Pure Indulgence 2-Quart Automatic Frozen Yogurt, Sorbet, and Ice Cream Maker becomes one of those great gifts to give because we usually don’t think of buying something like this for ourselves but it’s something we would love to get as a gift. What are the features of the Cuisinart ICE-30BC Pure Indulgence 2-Quart Automatic Frozen Yogurt, Sorbet, and Ice Cream Maker? What are the Benefits of the Cuisinart ICE-30BC? The instruction manual included in the box has a great recipe collection to get you started with ice cream, frozen yogurt and sorbet recipes from the get go. Most are quite easy and don’t take long to make (other than the prep of having to pre-freeze your bowl first). From the start, you can open your Cuisinart ICE-30BC and get to work creating a yummy homemade frozen treat! The design of the Cuisinart ICE-30BC is great as well. Often kitchen appliances take up too much countertop space. This small appliance has a simple stainless steel exterior and superior design so that it doesn’t take up a lot of space and doesn’t stand out either. What are the Drawbacks of Owning the Cuisinart ICE-30BC? Each time you make a frozen treat in the Cuisinart, it will take thirty minutes and the machine tends to make a bit of noise. This might bother some people but it’s not a really long time. In many of the reviews of the Cuisinart ICE-30BC, people mention that the noise isn’t that bad. Another thing to keep in mind is that you have enough space in your freezer to freeze the bowl before you use it in the machine. Your freezer also has to be cold enough to thoroughly freeze the bowl or your ice cream maker may not work correctly. 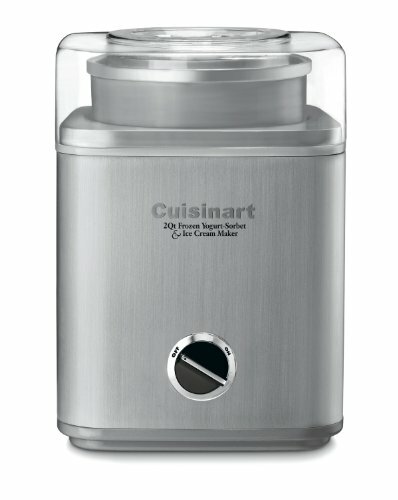 Is the Cuisinart ICE-30BC Pure Indulgence 2-Quart Automatic Frozen Yogurt, Sorbet, and Ice Credit: http://www.amazon.com/gp/customer-media/product-gallery/B0006ONQOC/ref=cm_ciu_pdp_images_all Cream Maker a good buy? This ice cream maker makes a great gift for your favorite foodie or anyone who likes to try new things in the kitchen. One doesn’t have to be a practiced cook to use this machine, anyone can and you have all the recipes to get started with in the manual inside the box. At approximately $64, this appliance is priced at over 50% off on Amazon and nearly 700 customers have rated this product an average of 4.5 stars. Basically it’s a fun, functional machine that can be enjoyed over and over again and at a price that is reasonable as well. Watch the video below to see a demonstration of the Cuisinart ICE-30BC Pure Indulgence 2-Quart Automatic Frozen Yogurt, Sorbet, and Ice Cream Maker.